Mika Salo must be wondering what it is about the 25th of March, as he suffers a high speed accident from car failure on the same date, two years in a row. The Finn's unfortunate early end to testing in France should come as something of a wake up call to the paddock, as the Formula One circus heads to Brazil - arguably the toughest circuit on the calendar, at least as far as the cars are concerned. Admittedly, that could be seen as a contentious statement. Monaco certainly tends to see more broken cars, courtesy of drivers making mistakes and plonking their delicate steeds into the barriers. But for tough, car breaking racing, Brazil is the real challenge for the designers, who know their cars are in for a pounding, even without the drivers making mistakes. Interlagos's bumpy nature resulted in both Saubers withdrawing after qualifying in 2000 - wing failures during practice had left both Mika Salo and Pedro Diniz in the barriers, so it was little surprise they exhibited little commitment during qualifying, and propped up the rest of the grid. 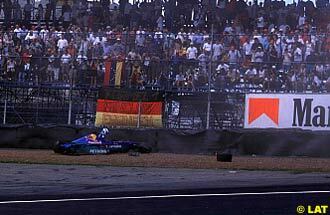 Peter Sauber did the only responsible thing in withdrawing, as the cars were clearly not safe to race. Preparing this year, Sauber are definitely not dicing with Interlagos. The new Sauber car sports an inherently stronger design for the rear wing, so that at least should be secure. However, the quest for speed in 2001, and the pursuit of every aerodynamic advantage, has given the team a front wing that is offering some cause for concern. Rather than testing on track, the team has been working in the wind tunnel and on their test rig to provide an efficient wing that can withstand the bumpy nature of Interlagos, with 330 km/h of wind induced downforce. The smooth surface at Barcelona is not good for reproducing those stresses. Williams, however, used plenty of their track time from the Barcelona test to work on tyre selection for the event. The bumpy nature of the circuit is a setup challenge, as softening the suspension to compensate for bumps makes the car pitch and roll more in corners, upsetting the aerodynamics. One way around that is to use softer rubber. The construction absorbs the bumps better, and the improved grip is good for traction. On the downside, Interlagos is notoriously tough on tyres, so getting the balance right is critical. The new tyres produced by Michelin and Bridgestone are demonstrating significant performance gains for the teams. Cars are expected to travel around four to five percent quicker over a lap, so operating in the normal medium downforce configuration, teams can expect to hit the biggest bump on the main straight at over 270 km/h, which will provide a real challenge to the mechanical reliability of the cars. Mechanical fatigue is likely to play a real part in the race, so more cars could fail at speed than last year - a detail which is not lost on the organisers, who have extended the guard rails and improved gravel traps in preparation. Importantly, plenty of effort has gone in to improving safety for marshals, and the more exposed posts have been replaced with reinforced 'cages'. On the other hand, the reduction in downforce should reduce the "updraft" from passing cars by around 30 percent - so Jean Alesi can at least look forward to racing without looking out for falling advertising placards. As Jordan head to Brazil, they are recognising that their early move into third place has an element of fortune to it, but that doesn't mean they intend to let it slip away. Widely publicised for commenting that "Ferrari and McLaren are the competition, not BAR," it remains British American Racing that poses the most important threat to their future. The contract for Honda engines does not come without some conditions, the most important of which is that losing to BAR in the Championship in 2001 and 2002 gives Honda an option to terminate the agreement. That said, the team has not come into this season looking to beat BAR - they are firmly set on achieving the World Championship, and that means, as quoted closing on McLaren and Ferrari and then beating the leading duo. Winter testing showed Jordan that on the right day they actually have the potential to beat McLaren. The EJ11 is exceptionally good, and backed up with Honda power. And Honda's engine may not be the best on the grid just yet - arguably coming behind Ferrari, Mercedes and BMW for useful power at this stage - but there is a lot still to come. However, significant improvement from Honda is not expected until the Spanish Grand Prix, alongside the re-introduction of traction control. Jordan think that at a typical circuit, McLaren have around three tenths advantage, with Ferrari about half a second ahead. Qualifying behind the leaders by more than that is a reflection of lap quality - Schumacher typically finds three near-perfect laps in qualifying, whilst Frentzen and Trulli both consider themselves lucky with two. Making up the difference to the front is tough - and starts with establishing the deficit. Analysis from the first two races gives interesting reading. 0.1 seconds from aerodynamics - although impossible to quantify, Jordan estimate a tenth deficit. When put into those terms, it's easy to understand why Jordan spent a significant part of their last test evaluating Bridgestone tyres and working on setup. Even closing the gap by three tenths could put them on par with McLaren, and that, they believe, should be sufficient for third overall. Every year, particularly around this time of the season, speculation about the future of all the key players in the sport takes off. For the most part, the rumours are contradictory, unlikely, or just plain untrue, but all too often there are gems hidden amongst the dross that bear consideration. 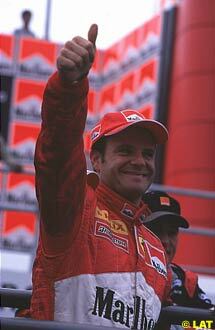 Rubens Barrichello could be talking his way out of a seat for 2002 according to the latest rumours. Although far less outspoken than Eddie Irvine ever was, the Brazilian has been letting his mouth get the better of him, resulting in a directive from Jean Todt to toe the party line. As things stand, there are plenty of Ferrari team members who would be happy to see his contract expire at the end of the year. 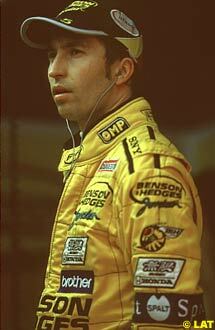 Gaston Mazzacane continues to inspire speculation concerning his pending departure from Prost. The Argentine scoffs at the rumours, which are also denied by Prost, but testing Stephane Sarrazin and Oriol Servia - ostensibly for the redundant test driver role - has added fuel to the fire. Rumours suggest that Ricardo Zonta was offered - and has turned down - a test drive at Prost. Zonta apparently prefers his Jordan test seat, but the leaking of this offer from Prost has certainly fuelled rumours that Gaston Mazzacane will be soon replaced.